Soul, in the analogy of the chariot, and in the several determinations of eros, points to the living soul, in its full range. Something else is sought in the Phaedo. The furrowed abyssal gorges of Plato’s thought, which is one and the same as the dialogue, struggle with the question of the soul itself. The soul itself is dimly presenced in the talk of the soul of the dead. The soul of the dead is identified with the source of the recollection, or, that which is brought out through a peculiar manner of association. The soul of the dead is synonymous with, but not identical to, the true soul and the unconcealed soul. The true soul, and the unconcealed soul, however, speak of the same subject matter, insofar as unconcealment is the correct understanding of the true. It seems that quite early in our investigation you have hit on the very thing we are searching for: the true soul is ‘unconcealed’. If you can just let us know what this means I believe we will have the opportunity of cutting out much leg-work and interminable door to door enquiry, the thought of which is quite daunting to a bear of little brain. The individual soul, dead or alive, helps us little in our enquiry, and at every turn heteros taunts us – what is the difference between a dead and living soul, or between individual or universal soul? In my desperation I was thinking of leaving Phaedo completely at least until we are in a position to throw much needed light on these passages I so casually laid down at the outset. At the moment I can only think of a single path by which reach we can reach our Temple of Zeus, but that means a trek through Timaeus, where the water-holes are scarce and the terrain mountainous; and, as I said, for which I must prepare some graphics, no doubt beautiful to behold but wearisome to construct and embed. So if the unconcealing of soul is truth of soul it must at least lighten my load, for it was I that got us into this mess. Let me tell you a little of the nature of the mess. Of the four possibilities I offered you before, I felt sure, and still do I suppose, that the last is the only ‘safe’ choice, as Socrates might put it. The soul not only can calculate, comprehend reversal (look at Republic 524) and contemplate the All, it also can be seen everywhere seeking pleasure and avoiding pain. But then the question must be asked, are we not merely seeking two things rather than a single entity? Pleasure seeking is after all an activity of a different genos to the contemplating of cosmos. Not if in some way we can somehow draw them together. But how can such diversities be one? A cat has a soul no doubt and pursues its pleasures while skilfully avoiding pains, but this cat-soul doesn’t contemplate existence (we assume). When a human frets over his mortality my conviction is that the fear that touches him is not merely a natural instinct of life preservation (which the cat has most vehemently), but is something that may occur quite independently and importantly, unbidden. It may occur at a moment of great happiness or pleasurable gratification. How could this be? How could we fear in such a way if we had no concept of eternity? But then I come to an impasse which makes me want to abandon this whole line of thinking. For do we deny an animal its own soul by limiting it to a mere animal thumos and therefore condemn it to a mortality that the human thumos would also be prey to, if it did not have this connection to reason and universality in the higher soul, if it lacked this 'inner touch' that makes it fear for itself ‘in the dead of night’ as it were. I cannot see if we deny this connection there can be any case for a soul which embraces eternity, a psuche kosmike. Eternity would be itself up there and the body disconnected down here, rather as Plato’s Parmenides offered. If there is a true soul its unconcealment may prove a catharsis for this depressing state of affairs and lead us to a correct understanding of the situation. Otherwise it will be the nodose path of Timaeus that we are forced to take, graphics et al. “By no means,” said he. The animal soul, like the living soul, is not the soul itself. Just as the soul with attachment to the body is not the soul itself. A perfect circle is but the conceptual circle, equidistant from its center at each point, any fool can think that. Ergo, the commonplace teaching of Plato’s “ideal” circle, a little more perfect, is wholly erroneous. For Plato says, knowledge of it is only gained with difficulty, and then only after great study. And that it leaps from one to another like a flame from tree to tree. Or to him with the gift to see it through a singular study on his own. No, the ideas themselves, like the equal itself, are that that let the world be there at all. Plato attempts to draw towards the soul itself, for he says, there is a soul in companionship with the living soul, the body, even in death. Even in this, he does unconceal something of the mystery. He lets something draw towards his most reflective and still readers. This is still a passionate soul. Even the highest eros, that which draws towards wisdom, is of a frenzied soul, and not of the simple still soul. Plato, however, if we are not drawn utterly into more shadows, cast between his days and our own, is wrangling with a special form of his essential difficulty. That of the genuine grounding of the ideas. For, it is manifestly inadequate to merely solve the problem verbally by saying they rest in the soul itself. For the soul too is an idea, even if the most perfect. Here, the work with the name Plato, even thinks the soul as the place of the idea of the good. An account of the true soul is, at first, not so difficult. If we are simply content with verbal formula. However, Plato will shun us, and even flee from us, if he perceives us to despise him in the modern manner. Even to cultivate a sense of humour towards him. When Bertrand Russell adduces his paradox of the “set of all sets”, that the “set” that contains all books, and has on it the title “book”, becomes involved in a regress if it is dragged into the group of “sets” it itself is meant to contain, one can hear Plato’s neck crimple as he looks askance and pulls the drawstring on his cowl, realizing that Russel merely want to “solve” this difficulty by announcing that there is a rule by which no “set” can be “self referential”. Plato senses, then that we despise him, and he evades us utterly. Such quasi-disclosing is defective. Yet, if we are to learn genuine disclosure we must revere Plato, as best we can, and thus perhaps he should give himself up and turn his glance upon us. The true soul, on first blush, is the name for the place of all the ideas. Just as nature is the name for the place of all the visible bodies. However, we must be on guard against superficial schematic posing of this fundamental subject matter of Plato, which he is still thinking as was his thinking in his original days, for his work is a fetus, full of growth, which we may abort and bring to ruin. Again, if your account appears to you worthy of consideration, I would have you bring it out and make it plain. Well, I would like to get on with it but now you have provided me with some new impasses. First, your reverence of Plato is making you say things that sound peculiar to me, but which I hesitate to question for fear of treading on hallowed ground. You paint a picture of the philosopher hiding or darting around behind the words of his dialogues and only revealing himself to a chosen few. Indeed, I remarked on this tendency of yours I believe in an early post. If I didn't feel so intimidated I would ask where is your authority to state that the true soul is the name of the place of the Forms? If this is so, my whole thesis collapses to the ground, and certainly my reading of Timaeus. I take it, along with many others, that soul in Platonic doctrine stands, among other things, for a kind of bridge or dicastes mesites between that world of Forms and the world of Body. So there’s little point in starting my journey on a possibly fallacious basis now that you have revealed what you think soul’s unconcealment is. Let’s hammer this one out. You must know what heteros means, so far as it speaks of the apple and the orange, where does the not knowing come from? The subject matter is there, and so too the word, and to boot it wouldn’t be the hardest thing to cook up a definition. If we are to show that we find heteros questionable, that we know that we don’t know about it, supposing we could do that, would it not then be the ring of a hollow bell to sound off that your views about soul differ from mine and thus are inadmissible? Now, are they not perhaps right, who say that when Plato, thinking of the leaping of fire, prohibited writing, and prefered speech, he thought how a teacher, having there a student, could sense the motion of the understanding of the student? However, this understanding does not mean meer intelligibility, for all can see the bare intelligibility of the statement that the surface of the circle is equal in distance from the center at any part. In reciting such definition we speak like a book, that is, we say what could as easily be transmitted by mere words which always speak in the same way. I see nothing, as yet, out of harmony with my view in your in-between. Ergo, you must find the initiative to dance, for when the bride dances, even if she fall, people will say the floor is crooked. So you must take courage in this. Formally, it amounts to this, we do not even know what body is, how little, then, can we say it is different from form? It is perhaps, I gather from what you write, more true to say that form is the most perfect form (rather than what I have written). For form itself is surely a more perfect form than the good or soul. However, we must not be too carried away by mere statements of abstract intelligibility. I apologise for being absent on this thread for a period. Musicians must take their work where and when they can get it. I hope to post on this coming Sunday afternoon. I apologise for my tardiness. Suffice that it was unavoidable. Due to your acknowledgement of soul as an intermediary I have been saved an intimidating detour through Timaeus, although I suspect this is only a postponement. Your circle has no ‘straight’ in it; that lathe-turned circle is an effigy constructed not of the circular but of tangents. An infinity of tangents for Plato cannot escape the otherness* of the 'straight', as here you talk of the 'circle itself', probably from the Seventh Letter. You perhaps agree with this. Falling under the same edict is Beauty itself in which we will never find otherness. The dialectic here would go: Beauty itself contains no otherness for if it did that otherness would be other than Beauty and our Beauty would fall under another Beauty and another until it rested in Beauty itself with no otherness. But how then would the unbeautiful exist as other than beauty? That is a legitimate concern. Let’s leave it there for now. Socrates then speaks of two Forms/eide that together seem to form a dyad. Can you have a large without a small? It would seem not. Yet they are a natural opposition and perhaps he brings them out for the restatement of the passage of [96d] at [100e]. Nevertheless he seems not to make it clear at this point what he clarifies later. that the Large has no otherness, that is, in this case, nothing of the Small, and the smallness likewise contains no hint of largeness. The needs of mathematics are particularly dyadic presupposing an underlying structure of two. Each number is ultimately a Form and as such has no otherness, existing in itself alone. If it is larger than another number it is by largeness alone that it is so, for it seems, and Klein agrees, that number forms are non-calculable and form no part of the reckoning art, logistike, but belong to that ‘superior’ study arithmetike. Socrates' mathematician friends might have shaken their heads in bemusement at this passage, until they saw what he was up to. We, today, have to start again, and think it out for ourselves. This is my attempt. You may think little of it. So each number in itself is a Form. It has one value and that is its own value. But a number as a difference is not ‘in itself’, and some things can be said of it. 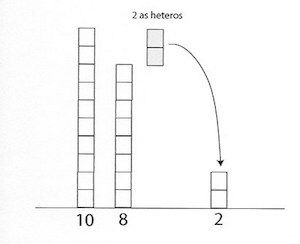 First, being heteros it has two values. Whenever we mention difference there must be the involvement of at least two things. Later this increases to three. The nature of this ‘two’ as heteros condemns it to existence in a Heracleitian flux. Thus its value is not only twofold but infinitely manifold (just as the indeterminate dyad is manifold). Therefore difference, although the same as itself (as is everything utterable - even non-being can be called 'itself'), is shown to exist as disproportionate to everything else. Yet, as with all otherness, without ‘everything else’ it cannot exist at all. If, in this case, difference were to be proportionate ‘both ways round’ as it were, the two which is a quarter of eight would have to become two and a half to be a quarter of ten. And this would no longer be a single difference, more an inexpressible absurdity, the mathematical matrix being as it is. We hardly have touched anything yet, but I believe this has opened a new portal on a rich field which will clarify many things to those that have this particular perplexity of mine. I'm afraid it is not as beautiful as the visualisations that flow effortlessly from the Timaeus text but here we see that 'two' as heteros, ill at ease within the arithmetic flux, is a different entity to the eight, ten and even two itself, when at complete rest in their respective roots. That will have to end this strand - at least temporarily. * For those confused by Greek terminology, heteros can be translated as 'other' or 'different'. Thateros adds the definite article - 'the other/different'. Even though it will displease you, I must post this initial interlude. Though, I shouldn’t like you to think of it as contradicting what you write, but only as flowing over it like a river of thought. I regard “circle itself” as our ‘ability’, or the soul’s tendency, to draw towards the subject matter of the circle. That is about nous. The perfection of the circle belongs, in contradistinction to this, to the region of episteme. Any fool can grasp the epistemic meaning (of the phrase “circle itself”), but not the noetic. Right instincts and habits are more difficult to acquire there (or to regain). The subject matter is in the circle on the lathe, the name, the definition, the empirical coming upon of the quality, and the epistemic perfection (this names 5). The circle itself for nous, rather than for episteme, is what lets itself be shown, and what we draw towards, as being. It is the source of the river of beings, if you like. It is because it is, not by a cause. The circle itself has nothing to do with a more perfect circle. That is how episteme leads us to it. Weaning us as it were. Because even the most imperfect circle is only there by the idea, circle. Is it not so? Even in speaking of the straight line, we are ready to say, it is not a circle, and thus to measure it by the circle itself. The perfect circle of episteme, like the worst circle of the empirical, is only there because we have at our disposal the circle as idea. The idea is never the thing without or within. It is unqualified. Simply the circle, and that means, if we try to explain it by setting it alongside other things, the unique nature we call circular, we loose its fire. We put the fire in a vacuum of cognition. To oppose it to the straight is already to speak as a scientist. We loose the simple circle, as it first appears to us, as what is neither impeccable nor merely average. Now, in a certain sense, I would propose that the distinction between the early numbers, and the strict mathimatikos, must, perhaps paradoxically, lean towards the early numbers. Moderns think the perfection of the abstraction, for we now think of inner objects as abstract, is the mere concept. And so they speak of Platonic numbers, of the perfection. But, nous is to be found in direct inspection, in the early numbers. Now, I am still meditating on this, is it that both cause and result in the question of the heteros of 8 and 10, are thinkable as mathimatikos and as early number? What does cause mean, what does result mean? Are they, indeed, the fruit of the division of the early numbers and the scientific numbers? My natural impulsiveness, may, at first, be an impediment to thought, but I am still thinking over what is said. Before we move on, regarding your query, can I ask you if you see, think or feel that there is anything different in the status of the 'two' which stands between eight and ten, in my diagram, and the two which stands upon the same base as the eight and the ten? In other words, can we yet move on or do we need to discuss this further? You mean, then, that there is two as two, and, also, two as the the quality of an operation? Just as one might say, you are yourself, but, also, you are bald, you are a criminal, you are standing in the dancing rain drops. Well, to me, it is clear that the ‘two’ placed upon the same base as the eight and ten is 'two in itself'. As such it cannot be the difference between eight and ten. In Socrates own reckoning, it is ‘too small’. This is clear is it not? But that means the ‘two’ suspended between eight and ten is posing as a difference between those two numbers. It must have a status other than ‘two itself’. However, is it not impossible to ignore the question of one and many here? Intellect, always enmeshed in the many, never reaches nous. You move in its steep-sided defiles, unable to see the sun, though part of its luminance seems to energise you. Is not “the difference between 8 and ten” two itself? If you put 2 alongside 8 and 10, and then you use the intellect, rather than nous proper, to derive the notion that that is the true and proper 2, namely 2 itself, you go to 2 itself by another mountainous track. On the other hand, I would not wish to dissuade you from continuing your investigation in your own fashion, since I feel I do see what you mean. The way I see it you’ve got nothing to lose. I’m the one with my head on the block. Anyway, we can see that Socrates is answering these questions by avoiding ‘otherness’. This is quite understandable since he has, between the two ‘sailings’ of  and , ‘come upon’ his theory of Forms, and is no doubt testing out how eternal answers can be maintained in a world without otherness, including those areas we normally assume otherly. There is no denying the other tried and tested methods but they are not secured on an adequate philosophical basis for his notion of arithmetike. He introduces the subject formally to the reader of dialogues at Republic 522c, and which, at 523a he claims “That it is one of the subjects we are looking for, which naturally leads to thought, though no one makes proper use of its power to draw man to reality”. Alla men (but indeed) logistike (reckoning) te kai arithmetike (and the science of arithmetic) peri arithmon ( are about number)pasa (wholly). “And, further,” I said, “it occurs to me, now that the study of reckoning has been mentioned, [525d] that there is something fine in it, and that it is useful for our purpose in many ways, provided it is pursued for the sake of knowledge and not for huckstering.” “In what respect?” he said. “Why, in respect of the very point of which we were speaking, that it strongly directs the soul upward and compels it to discourse about pure numbers, never acquiescing if anyone proffers to it in the discussion numbers attached to visible and tangible bodies." This seems to lay the foundation for three levels of study, corresponding to three types of mathematical objects. There are  the eidetic units involved in number Forms,  the pure mathematical units which have ‘something fine’ about them and  the aesthetic units to be found mainly in physical objects, the sole province of shop keepers and all of us who go about our daily reckonings at the shop counter and everywhere. Later I want to examine Aristotle’s take on all this, which can be found at Metaphysics 1081a, and why I don’t want to go down that route. I think that little excursus was necessary. As I said, I’m trying to find heteros via the ‘first and second sailings’ that Socrates uses in Phaedo  and  and to see how Socrates conceives the activity of numbers he calls arithmetike. This little problem I attempt to pose in my figure is entirely brought together for that purpose. If we pursue this, with the help of some of the notions of Jacob Klein (among others) I think we can come upon nous and dianoia from a fresh angle - though my destination is quite different to those I 'consult’ along the way. If we hold the points you make in mind we should be able to deal with them in due course. There is a path opening up, whether it ends up in a thicket I can’t yet tell. Also the 'one and many' aporia is I’m sure treatable by this approach, so I’m not discarding it but I agree with Klein that you cannot grasp this clearly until the whole art of numbers has been carefully unravelled and we get an idea of what an arithmos is. If the way I’m going is a true approach then your queries will be adequately addressed. If not, at least interesting areas of study will be revealed. What has come to light in between these two ‘sailings’ is a notion about eidos – Form - that is slightly more advanced than merely ‘things sharing a common characteristic’. Also it is intimated that the Form has no otherness or it cannot be a form. With Beauty, Justice, The Good it seems it can be dialectically argued as I tried to show earlier. These Forms do not have opposites in the strict way of things. That is, any opposite imputed of Beauty will be a degradation of Beauty, and the same with Justice and the Good. However the Large and the Small are true oppositions. Smallness is not a degradation of largeness and neither is Largeness a cankered version of Smallness. I see this as a valid distinction. Now we see Socrates claiming that the reason for ten being greater than eight is not two, but that it is greater ‘by number’ that is, greater in numerosity. The largeness of ten ‘defeats’ the largeness of eight, and eight is forced into its opposite, smallness. Now is there otherness in these statements? I think not though you may disagree. This is the way Socrates later seems to be handling these kind of Forms in his proof of the Soul’s immortality. Now I am taking it that if for Socrates Largeness and Smallness of number are the reasons for their difference then ‘two’ is relieved of that responsibility. That is why I said that two is more a ‘result’, in the modern meaning of the word, than a cause. However, two itself cannot be a ‘result’; therefore in that certain way the difference is not the thing itself, that is, in this case, not ‘the two itself’. There is much more to be said on this, as we are still only scratch the surface. What has been uncovered also needs to be bedded down properly. Will our interest can be maintained for the long haul. After all we are but bears of little brain, products of two rather decadent centuries as far as attention span is concerned. This too, is a question of the one and the many. In the early Greek sense, of the pre-Platonics. Whoever knows only the early numbers does not know numbers, only he who knows the “fine” numbers reaches number. By the early numbers I mean something like what Klein calls “counting numbers”. The early numbers differ from the counting numbers because they are early and not the late or proper numbers which have no part in phusis, but belong to episteme or proper knowing according to the Platonic teaching. In this sense Plato speaks of ontic beings, but never of ontology in Heidegger’s sense. Speaking back from Aristotle it is easy to bring a certain absoluteness to number. Are you sure this way of thinking is in Plato/Socrates? If we would gain a footing in the thinking of Plato, we must be cautious. This is the point of greatest caution. When is Aristotle, he who comes later and perfects Plato, leading us back through a dubitative seduction of the largest magnitude of bulk: Plato always was tending this way. We have here the problem of the man in the Cowl, do you know, you planetary strain of beings, your progenitor, who has made this way of thinking, which is that which brings European Science to its flowering, and makes it the flower of all thinking on the earth? Certainly! So speaks the professor who teaches that Aristotle is a kind of modern biologist and polymath, and yet, when the shadowy figure of the man who most of all evades us comes near, he says, him, I don’t know anything about that dark wretch of no account. Yet, this Plato who hides is the one we must seek, for he is the Plato who is not yet made perfect. Needless to say, whoever takes a wrong step will break their ankle, and perhaps never regain their footing. Does doxa, supposing doxa lets things come together as a subject matter, and is a kind of knowing, speak of all these? Mathema: the learnable, and teachable, a source of reliable knowing. This can be said about a mathematician's skill, but also as a quality of logos, it can also name reason. Where reason is a specific interpretation of logos or speach. I certainly want to take into account the things you say, except I am being as cautious as I possibly can and am very wary of welcoming Aristotle into our argument. You see, in my clouded vision I feel that Socrates has taken up this strange stance in these two short passages in the light of the unusual counterpoint they provide to his ‘external’ situation - for a man will soon be bringing hemlock. What more apt situation to contemplate the ephemeral nature of all but the finest calculations when compared to the august unmoved-ness of what Klein calls the eidetic numbers. “My glorious hope, my friend, was quickly snatched away from me. As I went on with my reading I saw that the man made no use of [cosmic] intelligence, and did not assign any real causes for the ordering of things, but mentioned as causes air and ether and water and many other absurdities. And it seemed to me it was very much as if one should say that Socrates does with intelligence whatever he does, and then, in trying to give the causes of the particular thing I do, should say first that I am now sitting here because my body is composed of bones and sinews, and the bones are hard and have joints which divide them and the sinews can be contracted and relaxed and, with the flesh and the skin which contains them all, are laid about the bones; and so, as the bones are hung loose in their ligaments, the sinews, by relaxing and contracting, make me able to bend my limbs now, and that is the cause of my sitting here with my legs bent. Or as if in the same way he should give voice and air and hearing and countless other things of the sort as causes for our talking with each other, and should fail to mention the real causes, which are, that the Athenians decided that it was best to condemn me, and therefore I have decided that it was best for me to sit here and that it is right for me to stay and undergo whatever penalty they order." "it is the leading-string, golden and holy, of “calculation,” (logismou) a power which in the state is called public law; and whereas the other cords are hard and steely and of every possible shape and semblance, this one is flexible and uniform, since it is of gold. With that most excellent leading-string of the law we must needs co-operate always; for since calculation is excellent, but gentle rather than forceful, its leading-string needs helpers to ensure that the golden kind within us may vanquish the other kinds." What he means by ‘fine calculation’ regarding numbers and mathematics is a moot point, something we may investigate, but I suspect it would be something which took in the twin principles of Same and Other. Here in our thread it chimes in unison with Socrates 'finest of calculations' to "stay and undergo any penalty they order." Proportionality is one such 'fine calculation' balancing equalities as well as encompassing difference. It’s well known that a ratio, which must contain heteros, is unified by proportionality: so, for example, the combined ratios of 4:6:9 may be slightly repositioned as 4:6::6:9 to reveal sameness in each ‘portion’ of the pro-portion, that is, the 2:3 ratio. Again we scratch the surface here with stray examples that are best tackled on a dedicated thread. What does impinge on our own topic is the power of proportionality – analogia - when used in the realm of connected notions, for that is what I am trying to achieve here in perhaps a ham-fisted fashion. Socrates handles it expertly in Gorgias, where he opposes dialectically health (in all its aspects) with flattery. There are at least two forms of proportionality here, For example: as medicine is to exercise, cookery is to ornamentation – a simple discontinuous proportion. The power of analogia becomes almost undeniable when transferred from body to mind: as medicine is to exercise, so administration of justice is to the legislative process; following on this as, cookery is to ornamentation , so rhetoric is to sophistry, which finally delivers: as administration of justice is to rhetoric, so the legislative process is to sophistry. I say, almost undeniable, because we still need to agree with Socrates that the judgements he makes regarding the individual relationships are what we consider sound. Without wishing to sound tiresome I stress that all this needs careful enquiry. We, aspiring to philosophy should not mix things up, and try to find out just what Socrates is talking about. The greatest opposition in philosophy is between being and not-being. Sophist has shown us that both are, for their opposition is not existential but intimately bound to the same and the other. Let us rest from this a while. It is not endless. The study itself is long and difficult but what we need here I feel can be put down in a single post as I feel you may be impatient to pursue your own line of enquiry. Just as one might say, you are yourself, but, also, you are bald, you are a criminal, you are standing in the dancing rain drops. And 'you' are also ‘one’. You may have access to a copy of Klein's Greek Mathematical Thought where he tackles this problem in his own way (pp100-103). If we ‘disregard’ all those other aspects of ‘you’ we have the beginnings of the notion of the noetic unit. But there is no eidos in sight in Aristotle’s approach and therefore, useful as it was for furnishing an epistemic foundation for the applied mathematicians, it doesn’t address heteros nor the point Socrates is making. Perhaps it would make a good subject of investigation in itself however Aristotle’s ‘rock of perfection’ is an unwanted peril for our second voyage - or am I merely paddling up my own creek?